I’ve been working through thoughts and frustrations that are along the lines of, “Why can’t I just do what I know I’m supposed to?” (like exercising, not being generous enough or compassionate enough, among other things) and “Why do I do what I’m not supposed to?” (like eating badly, not watching what I say, working in my own strength instead of God’s… the list goes on and on). These are perennial things I do that I feel like I should have conquered by now. My struggle reminded me of Romans 7 where Apostle Paul talks about the battle between flesh and spirit. After Paul talks about the struggle, he goes on to talk about grace and the freedom we can live in because of Jesus. God has given me the grace to step out of the battle and trust in the work of Jesus. Not that I give in to the pull of the flesh (that would be serving the flesh and we’ve died to that, see Romans 6:1-3), but that I can believe in the mercy of His love. He’s poured out over me the grace I need to set aside the battle and step into His love. Today, as I started going around and around about what I hadn’t done or what felt impossible to do, I remembered this and took a deep breath, and focused instead on His grace. Isaiah 26 has a promise of perfect peace. That sure sounds nice, especially during one of the busiest times of year. As easy as it would be to simply say, “God promises me perfect peace! Yay!” There’s a couple things that need to be considered in this passage in addition to that. There are two types of promises in the scriptures, unconditional promises and conditional promises. Unconditional promises are the ones that we don’t have to do anything to get and conditional promise are ones that requires something of us first. The easiest type of conditional promise to see is the “If you…, then God …” format. For example, “For if you forgive others their trespasses, your heavenly Father will also forgive you, but if you do not forgive others their trespasses, neither will your Father forgive your trespasses.” (Matthew 6:14-15 ESV). The “if’ section is clearly defined in that passage. Other verses are conditional promises but don’t contain the word “if”. Isaiah 26:3 is an example of this. Yes, it promises us perfect peace, but there’s a condition to it. In order to receive the promise of perfect piece, first I must stay my mind on God, meaning I must keep my mind focused on God. The second things this verse tells me is how to stay my mind. It’s easy to say I’m going to stay my mind on Him. Then as the day gets busy and the world starts trying to distract me, I wander and lost my focus. As my focus wanders away, so does my peace. Fortunately for me, God tells me how to keep my focus on Him: trust Him. 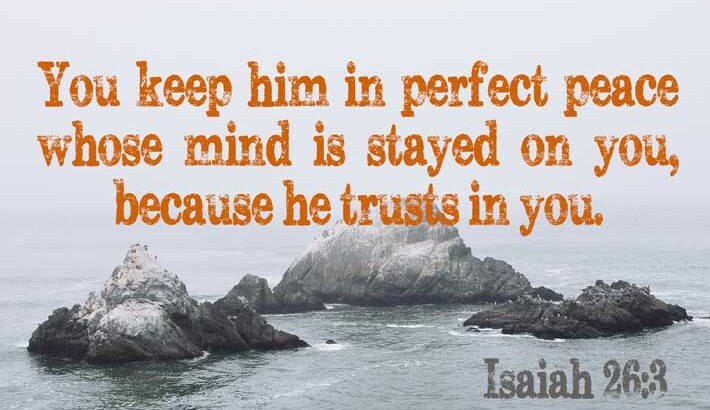 The person who trusts God is able to keep their mind focused on God and will reap the benefit of perfect peace. Merriam-Webster defines trust as, “firm belief in the reliability, truth, ability, or strength of someone or something.” In order to have a firm belief in God’s reliability, truth, ability, or strength, we have to first know what His reliability, truth, ability, or strength are. We gain trust in God through two ways. One, we find it out through personal experience with Him. This can be different things in our lives, but many times it’s some kind of experience where we ask Him for something and we see the results. Because of that, we choose to have more trust in Him. 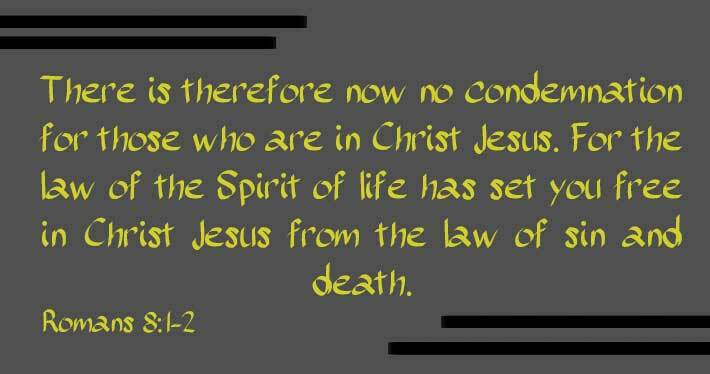 The second way is through the scriptures. We see a promise in the Word and we choose to put our trust in it, even though we’ve personally not experienced it. For me, the second way is much harder but reaps much greater benefit when I do it. I wish that this was a one-time process. Instead, this process is cyclical. Once you’ve started trusting in Him, you begin to reap the promises. Then, because you’ve seen the blessings, you begin to trust Him deeper and the promises become more real. This process of trusting more and reaping more continues for our whole lives. Our relationship with God should never be static or boring. God is always calling us deeper in and blessing us more and more. Verse 4 of Isaiah 26 says, “Trust in the LORD forever, for the LORD GOD is an everlasting rock.” The stability of God compared to the ups and downs of life is like waves against a rock. God never moves or budges, no matter how much we do and no matter how much life throws at us. We can trust Him forever and stay our mind on Him, because He is a rock today and always. In Psalm 85, the psalmist talks about the result of those who fear the lord, those who salvation is near (v. 8). 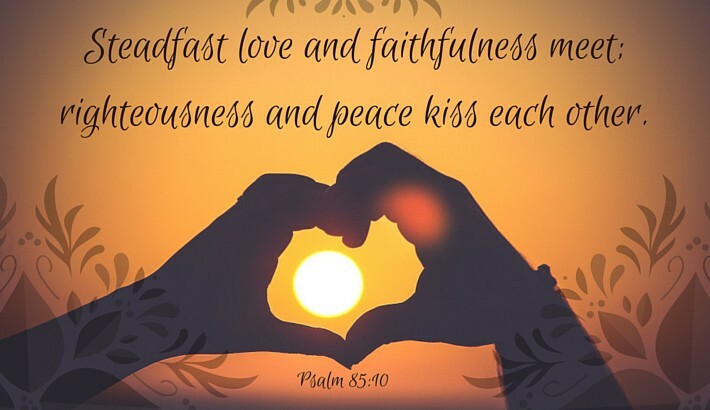 In the description of that, it says that, “Steadfast love and faithfulness meet; righteousness and peace kiss each other.”(v. 10). What beautiful imagery! The psalms are poetry and songs, things that are mean to elicit emotional responses. In that spirit of connotative worship, I give to you an analogy of star-crossed lovers; love and faithfulness ever apart and peace and righteousness separated by wicked designs. Imagine what love would be like without faithfulness. Love, a discipline of action that puts others first, is necessary for building healthy relationships. But love without faithfulness? It’s always finding ways to help strangers, but not worrying about being loyal through the long days. It’s giving fully and freely, but not consistently. How about faithfulness without love? It’s dogmatic determination without mercy. It’s loyalty without understanding. Taken to the extreme, it requires either gullibility or manipulation. Hardly an ideal worth pursuing or sacrificing for. As for the other couple, the world as it seems now would keep them eternally apart. Peace we can have sometimes, and righteousness we can have sometimes, but rarely together. Righteousness is fighting to find peace, ever searching for the other half it is made for. The evil in the world keeps the peace away. Soon righteousness can’t see the suffering any longer or stand the wickedness and it begins to fight for the afflicted. It stands up for the exile and sufferer at the cost of its most valued partner, peace. Peace wants to be with righteousness, but can’t be where war is, even when it’s a righteous battle against injustice. Instead, peace, trails behind righteousness, wanting to be near, but unable to. It finds quiet and joy in the aftermath of the righteous victory. But when the righteous fear the Lord and His glory fill us, finally our separated lovers can unite. Love and faithfulness can come together to bring long-term, consistent generosity and care. Peace and righteous and settle down together without losing ground to wickedness. The glory of the Lord will be seen in the bringing together of things that without His power will be forever separated. I hope to see a day where this isn’t a beautiful dream. Someday, I will see my redeemer with my own eyes and His glory will fill the earth and love and faithfulness will join together and peace and righteousness will be inseparable. Praise God that His plan is true no matter the chaos of our world! 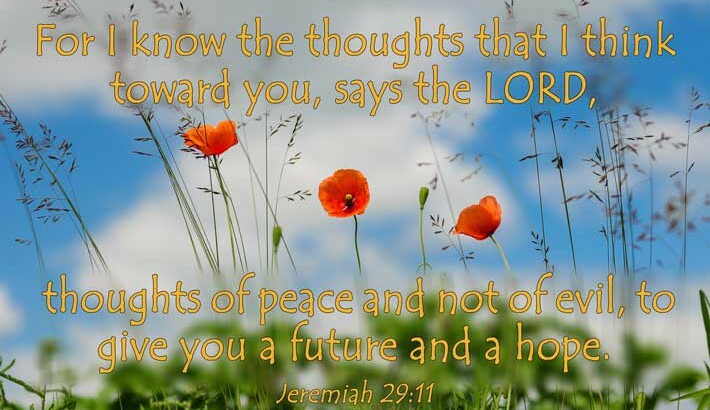 Jeremiah 29:11 is very commonly quoted scriptures. Searching the internet for images of this scripture brings up many fancy and beautifully made images of it. It is a wonderful verse of hope and promise. Often this verse is looked at without the context of the passage around it. In and of itself, it’s a good verse, but by adding in the context of what’s happening around it, we find this promise to be extra special in the context of troubled times. In the first part of the chapter, we hear God telling His people to settle into the land of Babylon. They are not to fight or rise up or listen to people who encourage anything other than this (v. 5-9). God also says in verse 4 that this exile has been allowed by God. The comfort from this passage is this: no matter where you are or how hopeless your circumstances seem, God has not forsaken you. He knows where you are and how you got there and what’s going to happen to you tomorrow. God is always bigger than our circumstances and He is working for our good and His eternal plan. Verse 10 begins God promise to Israel: your captivity will end, I know the day and I will keep my Word that you will come home. But it also contains an unpleasant truth, this captivity will last 70 years. The hope we can glean from this is knowing that God knows the exact passage out that we need. He knows when to bring it and He will, because He is good. We can trust Him and live in peace knowing that He’s the ultimate authority in our lives. Now, we come to the verse of promise. Verse 11, “For I know the thoughts that I think toward you, says the LORD, thoughts of peace and not of evil, to give you a future and a hope.” This promise is even sweeter when we know that it’s God reminding a lost and hurting people that they won’t be lost forever. God is working toward the good of all of his people, not simply the people in one time or in one place. His plan for a future and a hope is good and trustworthy. No matter what we feel like or see around us, we can rely on that. What’s your captivity right now? What’s your struggle that feels like it’s overwhelming you? God has an appointed time for you to step into His blessing. Lean on His word and live in peace while His plans come to a beautiful conclusion. 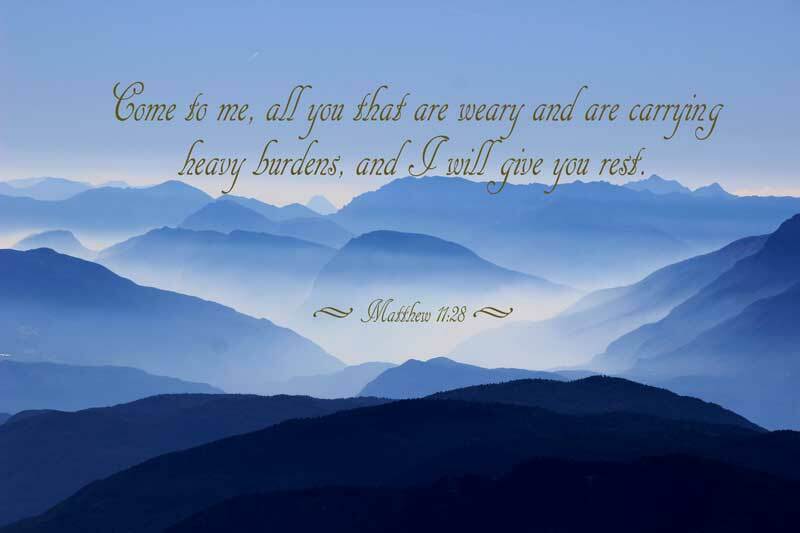 Come to me, all you that are weary and are carrying heavy burdens, and I will give you rest. Jesus and the book of Hebrews both talk about letting go of things in our life that are holding us down, weighing us down. Possibly, they’re talking about the extra pounds or extra items in our home, but not likely. We know that Jesus came because of the lost souls of His children and that’s what He is wanting to reach to, our souls. What are the soul weights that keep us down and make us unable to run the race God made us for? What are the burdens that we refuse to give to the Lord in order to rest? How does this impact our daily lives and our walk with the Lord? I am God’s workmanship, created in Christ unto good works (Ephesians 2:10). I am a new creature in Christ (2 Corinthians 5:17). I am a spirit being alive to God (Romans 6:11,1 Thessalonians 5:23). I am a believer, and the light of the Gospel shines in my mind (2 Corinthians 4:4). I am a doer of the Word and blessed in my actions (James 1:22,25). I am a joint-heir with Christ (Romans 8:17). I am more than a conqueror through Him Who loves me (Romans 8:37). I am an overcomer by the blood of the Lamb and the word of my testimony (Revelation 12:11). I am a partaker of His divine nature (2 Peter 1:3-4). I am an ambassador for Christ (2 Corinthians 5:20). I am part of a chosen generation, a royal priesthood, a holy nation, a purchased people (1 Peter 2:9). I am the righteousness of God in Jesus Christ (2 Corinthians 5:21). I am the temple of the Holy Spirit; I am not my own (1 Corinthians 6:19). I am the light of the world (Matthew 5:14). There are so many needs in the world. Heart-wrenching stories and troubles around every corner. As the body of Christ, we are made to be the hands and feet of the world. As individuals, we are called to good works that the Lord made for us to do. Sometimes it’s easy to forget that we have a specific calling and we try to fulfilling the calling of the whole body. Individually, we are not supposed to try to be the whole body to all people all the time. We are to be fitted together with the other believers who have their own specific gifts and talents in order to become the light the world needs to see. We can stop ourselves from find rest when we refuse to listen to the limitations the Lord has blessed us with and we do too much. Guilt often dovetails with the first point, not seeing yourself as God sees you. It can be more than just that, however, as it can come from so many different places. Others can place guilt on us, we can place guilt on ourselves, marketing ads or even random social media conversations can spark it in us. Guilt makes us unable to rest even when we’re not doing anything. Our minds race and our emotions churn as we think about all the “should” or “shouldn’t haves” we can possibly imagine. Sometimes, the guilt is validly earned. Sometimes, we can only eliminate it by repenting of the Lord and repairing relationships with others. However, most of the time we don’t simply leave it at that. If we can’t do what we think we need to do right this very minute (even if it’s the middle of the night), we stew and worry. Often times, even after we’ve worked through it, we still stew and worry. Rest requires peace and guilt destroys peace. We must find forgiveness and healing in the Lord from the guilt that steals our rest. God wants whole and healthy children. Colossians says, “So you also are complete through your union with Christ, who is the head over every ruler and authority.” He is the boss and He makes us whole. If there are patches in our heart that we haven’t submitted over to him to fill in with His grace and mercy, we run the risk of that darkness will steal our rest. Many times, unhealed areas spin into ideas that affect our view of ourselves and we’re back to the first one on this list, although that doesn’t happen every time. Unhealed areas are things that we avoid. It becomes areas that the devil can poke at and jeer at and keep us down with. We often compensate for hurt in our hearts in many various ways, from chocolate to criticism of others. Deep peaceful rest is more quickly able to be reached when we have silence from the hurting voices of our past. If rest isn’t a part of our daily routine, it can feel strange to try to find it. There are ways we can practice resting and find more of God’s peace in our hearts. Being still is a powerful way to find rest. We often don’t realize how much chaos is in our hearts and minds until our bodies slow down. When there’s no distractions on the outside, there’s more noise on the inside. Being still in and of itself may not feel particularly restful, depending on your personality. However, being still is a vital step to finding peace and rest because it’s the step that brings us into the peace realm. Think of it like the exit door from daily life. You can’t get out of the noise if you don’t know how to leave the room. Being still is choosing to step away and find peace. Often we spend all the time in the Lord’s presence talking to Him. Stillness often means listening more than talking. When we listen, we can hear the sweet songs He sings to us and the beauty of His words. Listening and being still are tightly woven together as it can be difficult to one without the other. Matthew 14:22-23 (14:19 IV) tells us that Jesus left the disciples in order to be alone. It was right after the feeding of the 4,000 and right before He walked on water. Jesus often took time to pray out from His ministry and we must do the same thing. It doesn’t have to be often, in fact, it probably should be all that often, but we need to do it. We need time away from the routine to focus on God and fill up on His presence. When we see and do the same things day in and day out, we fall into ruts that block our minds from hearing His voice. A fresh perspective often allows us to hear a fresh word. Being still is good, but it’s only half the equation if we’re not being filled by the presence of God as we do it. The refreshing breath of spiritual air that comes into our hearts in His presence is better than any other form of rest. We know God is with us and we know He’s near to us if we seek Him, but just knowing that sometimes isn’t enough to feel Him. We must choose to believe He’s near us no matter how we feel in the moment and actively ask Him to be more sensitive to Him. He may speak through your emotions or the scriptures you’re reading or through a song. In any case, the more consistent you become in seeking Him, more familiar you become with His presence and the quicker you can feel Him in the future. One of the things that can block us from resting in the Lord is simple selfishness. We don’t stop thinking about ourselves and our circumstances long enough to breathe let along think of someone else. Praying for other people when we’re struggling to get our mind off our troubles can be very helpful in stopping the spinning in our head and get our thoughts turned to the Lord. There’s nothing wrong with bring our requests to the Lord, multiple times even. However, when our circumstances have become blinders to seeing outside ourselves, we can sometimes pray for others to help break the cycle. The Lord is my shepherd, I shall not want. He makes me lie down in green pastures; he leads me beside still waters; he restores my soul. Let us allow the Lord to give us rest. Don’t allow the burdens of the past and fear of the future cloud your vision and clutter your mind. It will only steal the rest that God has in mind for you. The rest you need to live fully and completely, serving Him and His children. The Holy Bible: New Revised Standard Version. (1989). (Mt 11:28). Nashville: Thomas Nelson Publishers. Meyer, Joyce. “Knowing Who I Am in Christ.” Web. 16 Aug. 2015. <http://www.joycemeyer.org/articles/ea.aspx?article=knowing_who_i_am_in_christ>. Tyndale House Publishers. (2013). Holy Bible: New Living Translation (Col 2:10). Carol Stream, IL: Tyndale House Publishers. The Holy Bible: New Revised Standard Version. (1989). (Ps 23:1–3). Nashville: Thomas Nelson Publishers. We’re told not to worry and we know we’re supposed to praise instead. While praising is a wonderful general strategy for refocusing and reprioritizing our thoughts, are there any specific strategies for coping with valid concerns? 25 “Therefore I say to you, do not worry about your life, what you will eat or what you will drink; nor about your body, what you will put on. Is not life more than food and the body more than clothing? 26 “Look at the birds of the air, for they neither sow nor reap nor gather into barns; yet your heavenly Father feeds them. Are you not of more value than they? 27 “Which of you by worrying can add one cubit to his stature? 28 “So why do you worry about clothing? Consider the lilies of the field, how they grow: they neither toil nor spin; 29 “and yet I say to you that even Solomon in all his glory was not arrayed like one of these. 30 “Now if God so clothes the grass of the field, which today is, and tomorrow is thrown into the oven, will He not much more clothe you, O you of little faith? 31 “Therefore do not worry, saying, ‘What shall we eat?’ or ‘What shall we drink?’ or ‘What shall we wear?’ 32 “For after all these things the Gentiles seek. For your heavenly Father knows that you need all these things. 33 “But seek first the kingdom of God and His righteousness, and all these things shall be added to you. 34 “Therefore do not worry about tomorrow, for tomorrow will worry about its own things. Sufficient for the day is its own trouble. Verse 25 talks about not taking no thought for the material things of living. The word and its context at the time didn’t mean that deciding what pieces of clothing to wear today was wrong. How often when we tell ourselves not to worry, we are actually telling ourselves to delude ourselves about the current circumstances or the future resolution? We tell ourselves, “Don’t worry, it will all take care of itself.” Our mental salve for troubles and problems is to look for and hope for the resolution of the problem. The problem getting removed or resolved will happen sometimes. Sometimes, however, it won’t. The point of this passage is not to guarantee perfectly smooth living; it’s to tell us how to work through troubles that haven’t gone away. The New Living Translation translates verse 25 with, “Today’s trouble is enough for today.” It’s not about being trouble free; it’s about being filled up with power and knowledge of how to work through the troubles as they come. Sometimes a quick praise prayer can knock worried, anxious thoughts out of our head. Sometimes, the thoughts are more stubborn than that and they need to be intentionally removed. Acknowledge the concern if it’s valid. Jesus didn’t say that worry is made up or crazy. There are truly troubling things in life and truly difficult patches that we or our loved ones are walking through. It’s not about faking your way out of things or trying to pretend that nothing is wrong. While worries can be legitimate, worries can also run away with us. Our minds can be very imaginative with where things can go and taking things to a new level of problems doesn’t help us and doesn’t help us to trust the Lord. Acknowledge that today’s troubles are enough for today and you’re going to lean on the Lord through it. Sometimes we can be so anxious to feel like we’re doing something that we latch on to worry as something we can “do”. Because we’re focused on the problem, talking about it, or finding solutions in our own mind, we feel like we’re helping somehow. We’re not. Worry doesn’t do anything and it doesn’t change anything. If anything, it makes it worse. Worry isn’t just useless or a waste of time; it can acutally damage your faith and your ability to see God’s goodness and power. Deep down, the root of worry is that somehow, in some way, God isn’t going to keep one of His promises: maybe you don’t belive that He will provide, maybe you don’t believe He truly loves you and knows what you need. Whatever the block is, if you allow your focus to go to worry, you are tearing away and your foundation of belief in God. While it’s great to work our way through worry and finally feel like it’s defeated, it’s not complete to stop there. The antidote to worry is service to the kingdom of God. The verse that says, “… seek first the kingdom of God” wasn’t accidentally dropped into this passage. Our worry blinds us to the needs of others and the call of God. Once we’ve acknowledge the source of our worry (our disbelief) and surrendered that to God, we must act out that belief and the change in us by serving others. It doesn’t have to be a grand gesture; sometimes it’s just stepping up and making dinner on a night when you’d rather just curl up with a pint of ice cream. Maybe though, depending on your circumstances, getting out and serving others who are struggling, through more tradition outlets like serving the homeless or mentoring kids can be a huge help in keeping our perspective and humility before the Lord. Jamieson, R., Fausset, A. R., & Brown, D. (1997). Commentary Critical and Explanatory on the Whole Bible (Vol. 2, p. 28). Oak Harbor, WA: Logos Research Systems, Inc.
Merriam-Webster defines meditation as: the act or process of spending time in quiet thought. Current science has shown that it is more than just quiet thought; it is the process of choosing quite awareness. Meditation is defined by Dan Harris, author of 10% Happier, as the process of focusing on breathing, getting distracted, then refocusing on it. Researchers like Wendy Hasenkamp agree. In an attempt to see what meditation did to the mind, Wendy Hasenkamp asked participants to focus on their breathing. If their mind wandered, they were to push a button and refocus on their breathing. While they were doing this, their brains were being scanned by an MRI to see the changes in activity. The study showed that the mind, when switching to a meditating mode, used three different parts of the brain: the default mode network when the mind was wandering, regions of the brain that detected important or relevant information when the participants realized their mind was wandering, and the executive brain function took over to redirect the mind to focus on the correct thing. In addition to seeing the mind switch the areas it was using, participants who were more experienced at meditating were more quickly and completely able to switch back to the meditation when their mind wandered. Many places in scriptures we are commanded to meditate on the Lord, His ways, and His laws. The Old Testament promise for this is success and peace. Under the new covenant of the blood of Jesus, it is even more beneficial to focus our mind, as Apostle Paul reminds us, to find the peace of God that protects our hearts and minds. The process of meditation as described by Dan Harris or the research of Wendy Hasenkamp is about clearing your mind or about thinking about nothing. This is not what the scriptures say, but it is the first step of getting to a mental place where we can clear our thoughts to focus on who God is and what He’s done for us. If your mind is full of worry and troubles, just adding the good thoughts in won’t reset your mind; it will only clutter it more. Focusing on something as peaceful and regular and necessary as your breath can turn off the “worry circuits” in your mind and create a quiet place to bring in the thoughts of praise for the Lord. In the busyness of daily life, it can be difficult to see how the mundane tasks tie in with serving and glorifying God. It can be easy to divide our actions and even our thoughts into separate categories: the God stuff and the life stuff. However, every moment we’ve been given is a gift from God, not something that we have to get through in order to get to the “real” ones. Meditation offers a way to take a moment and feel connected with what we’re doing. It’s a way to bring a connection with God into anything and everything we’re doing. If you’re feeling overwhelmed by the cares of the world, or the demands of your day, stop and take one moment and find the peace of God. Still your mind through turning off your busy mind, and reconnect with God by choosing to focus on Him. Apostle Paul says the result of this kind of focused mind “will guard your hearts and your minds in Christ Jesus.” (Philippians 4:7). This kind of effort isn’t simply a good idea or suggestion. It’s the mechanism that we’ve been given to protect our devotion to Christ. We are constantly being shot with by the flaming arrows of the devil (Ephesians 6:16). Our faith can be potentially damaged if we don’t keep our focus on Him and seek His goodness in everything we do and see. In the parable of the sower, the seeds (the good news of Jesus Christ) that were strangled by thorns were the people who let the cares of the world take over and defeat the belief in Christ. We need to have a tool in our spiritual belt that allows us to fight the thorns away. Meditation is a heavyweight in the fight of keeping our faith strong and our focus on Christ. “Psychology Today.” Mindfulness. N.p., n.d. Web. 09 May 2015. <https://www.psychologytoday.com/basics/mindfulness>. Hasenkamp, Wendy. “How to Focus a Wandering Mind.” Berkeley, 13 July 2013. Web. 09 May 2015. <http://greatergood.berkeley.edu/article/item/how_to_focus_a_wandering_mind>. This is the same for us. We are faced daily with choices that bring us closer to God or farther away and we alone have the power to decide what we will do. Choice is something that is so much a part of our day and our routine that we often don’t recognize what it is what we’re doing. Our choices range from the mundane choices about what to have for breakfast to life altering choices like what to study in college. The choices that make the biggest impact on our day are the ones that impact our daily routines. Our daily routines are what build our habits and our habits reveal our character. Our choices are so powerful and so interconnected with who we are that it is important to understand the process of making a choice. Merriam-Webster defines “choice” as: “the opportunity or power to choose between two or more possibilities.” That is the simplest form of choice, picking on thing when you’ve been offered more than one thing. Yet making a choice is rarely that simple. Choice becomes complicated when there is some kind of a value put on each option until there is a cost for choosing one over the other. When there is loss implied with a choice, it is no longer as easy. So how to we begin to make the choices that we know we need to make even when the cost is higher than we thought it would be? Then, after fighting and winning, why do we so often go back and pick up the option that we thought we’d turned down? We are in the world of one and done mentality that tells us that if you have to redo something, you failed the first time. We are in a world of supercomputers that calculate complex mathematical ideas quickly and correctly the first time. We are taught through cultural expectations that once you get it right you’re done. Can’t run the track in the time limit? Do it again. Ran it successfully? You’re done. In the times that choice doesn’t work that way, it because choice must done right once, and then done right again, and again. When we are making lifestyle choices, we have to be in the place to make them and make them again and make them again. If we are relying on self-control to make these choices, we will run out of fuel. There is not enough mental capacity in us every day and every moment to make us stay on track. There’s a better mentality to have, one that keeps our choice ever in front of us without requiring self-control in every temptation to make it. The temptation of choice is only there as long as it is a choice. Once it’s no longer an option, there’s no battle. The battle is the decision. If the battle is continuing, the choice hasn’t been made. You may be using self-control to override your impulses or ignore the waffling, but it doesn’t mean it isn’t there. You may only fight this battle under certain circumstances and haven’t recently encountered the trigger that sets you off on this waffling. Another conflict that keeps us in a decision making loop is that we’ve made a choice and are lying to ourselves (or others, but that means we’ve lied to ourselves first in most cases) about what choice that is. We know what should go with this one, but deep down we want this one. We tell ourselves we’re OK with picking the “should” option. If, however, we are still thinking about it, still wanting it, no matter how small the desire, we will end up in conflict about it eventually. To make a complete choice, to fully decide, we have to not only select the option that we want to purse, but we must close the door on all the other options on the table. We must not string out the choice or pick one with qualifiers. Removing our interest in other options is commitment. It is dying to your past life. This is what it takes to change. If you were living in sin and you have been transformed and died to your old self through Jesus Christ, the choices from your old life are no longer an option. Why? Because you have to? No, because you realize that you are free for all things, but the only ones worth pursuing are the ones that bring life. The ones you choose means that there’s a whole lot that you don’t choose. If we only have one option in front of us that we’re told we have to take, then it’s not a choice. Choice means taking something from one or more things and letting go of all the ones we didn’t take. When we are faced with making the choice again, it is time to ask ourselves, what option have I left open (or what desire have I not been honest about) that has brought me back to this choice? It may take several times around to be willing to honestly and openly look at yourself and see what you have been desiring that is in conflict with your choice. Each time though, you have the option to fully and completely commit and choose. When the door has been closed, peace can come. Another way of saying this is that the contentment with the current circumstances comes when we fully acknowledge that other choices that were available to us are no longer available. We can make a mistake no matter how long we’ve lived or how long we’ve walked with Christ. As we learn how to make choices more completely, our mistakes in making choices not only will have a deeper impact on us, but we might be less willing to admit we made a mistake. This is where having a God of mercy and kindness is an amazing experience because He will lead us back to places that we thought were long gone. He redeems our mistaken past choices, no matter how good our intent, so we can walk in the fullest freedom with Him.